A young man who is torn between fulfilling the expectations of his family and following his heart, Manolo embarks on an adventure that spans three fantastic worlds where he must face his greatest fears. 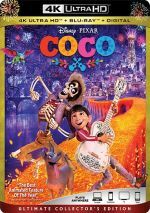 An animated adventure produced by notable filmmaker Guillermo del Toro, 2014’s The Book of Life offers a fable set in San Angel, Mexico. As told by a museum tour guide (voiced by Christina Applegate), two spirits watch the town: La Muerte (Kate Del Castillo) and Xibalba (Ron Perlman). La Muerte rules a realm where the deceased who remain remembered reside, while Xibalba controls the domain where the forgotten decay and vanish. Xibalba wants to control the Land of the Remembered and gets La Muerte to enter a wager. They bet on which young boy – Manolo Sánchez (Emil-Bastien Bouffard) or Joaquín Mondragon (Elias Garza) – will win the love of María Posada (Genesis Ochoa). We watch developments as the kids drift toward adulthood, mainly as we see grown-up Manolo (Diego Luna) launch into a mystical quest that may eventually earn Maria’s (Zoe Saldana) love. As a narrative, Book takes a while to get into gear. While the first act sets up the characters and situations in an appropriate manner, I can’t claim it offers a ton of entertainment. Instead, the initial half-hour or so tends to bog down in basic exposition. Granted, we need this material, and we still get some entertainment, but that opening can require a little patience. Happily, matters improve measurably once Manolo launches into his quest. Book becomes freed from its limitations, as it feels like the filmmakers finally get to dig into the fantasy material that interests them. And it likely delights the viewer as well. Once we get to the mystical realms, Book becomes vivid and enchanting, with plenty of inventive concepts and characters on display. These help raise Book above the pedestrian plot at its core. Face it: a tale about a love triangle doesn’t exactly jump off the screen in terms of it creativity or originality, even if it involves mystical concepts. The vivacity of the second and third acts allows us to ignore the semi-cliché elements, though, and a fine cast adds to the film as well. In addition to the actors already named, we find talents such as Channing Tatum, Hector Elizondo, Ice Cube, Danny Trejo, and others, all of whom bring verve to their parts. Book also boasts a vivid visual presentation. The movie goes with a distinctive look that brings us dynamic animated material, all of which stands out as unusual and lively. 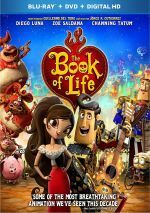 Due to its semi-sluggish opening act, The Book of Life doesn’t become a total winner. However, it compensates with its fun and inventive final hour, factors that make it a likable adventure. 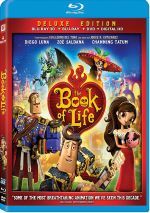 The Book of Life appears in an aspect ratio of approximately 2.39:1 on this Blu-ray Disc. Across the board, the movie looked great. Sharpness looked immaculate. At all times, the flick seemed crisp and well-defined, with no notable instances of softness on display. Jaggies and shimmering remained absent, and I noticed no signs of edge haloes. Source flaws played no role here, as the film stayed clean and fresh. Colors became a strength, as Book boasted a broad, dynamic palette and the hues always dazzled. The various tones were consistently lively and sumptuous. Blacks looked dark and tight, and shadows demonstrated good clarity and smoothness. I felt very pleased with this terrific transfer. The DTS-HD MA 7.1 soundtrack of Book soared. It came with a wide variety of sequences that gave us chances for vivid material, and it brought those out in a satisfying way. The movie used action and magical scenes to allow elements to zoom around the room, and other set pieces threw many different elements at the viewer. All of these combined in a lively manner that used the speakers to immerse us in the film. The mix packed in tons of information and blended it together well. Audio quality was solid. Music appeared vivid and rich, with good highs and warm lows. Speech was consistently distinctive and natural, while effects showed great range. Those elements appeared accurate and dynamic, as they packed a strong punch. Everything worked nicely here to form a strong soundtrack. This package includes both 2D and 3D versions of the film. The picture comments above reflected the 2D edition – how did the 3D compare? Visual quality largely seemed similar, as the 3D worked nearly as well. The 3D appeared a bit darker, and that reduced the vivacity of the colors to a minor degree, but overall, I thought the 3D looked almost as good as its 2D counterpart. Whatever minor visual downgrade we saw, the verve of the stereo presentation compensated. Like the story itself, the first act felt a little restrained, but the final hour of the movie offered a surfeit of visual delights. These meant we found a very nice sense of depth along with many effects that floated out of the screen. All of these contributed a great deal of fun and engaging material to make the 3D version the strongest way to watch the film. When we shift to extras, we begin with an audio commentary from co-writer/director Jorge R. Gutierrez. He offers a running, screen-specific look at story/characters, visuals and animation, cast and performances, music and connected domains. At times, Gutierrez offers a nice look at various production issues, so we learn a decent amount about the film. However, he tends to narrate the movie too much of the time. These factors make this an adequate but unexceptional commentary. A new animated short, The Adventures of Chuy runs three minutes, 17 seconds. It gives us a cute little tale with the movie’s porcine star. A few featurettes follow. Closer Look fills 10 minutes, 16 seconds and offers notes from Gutierrez, producer Guillermo del Toro, character designer Sandra Equihua, producer Brad Booker, and actors Zoe Saldana, Ron Perlman, Diego Luna, Christina Applegate, Channing Tatum, Cheech Marin, Kate Del Castillo, Ice Cube, and Hector Elizondo. “Look” examines Gutierrez’s impact on the production, inspirations, visual design and animation, story and characters, cast and performances. While that’s a good array of subjects, “Look” handles them in a fluffy, superficial way, so don’t expect much depth. During the eight-minute, 44-second The Music of Life, we hear from Gutierrez, del Toro, Luna, Marin, and composer Gustavo Santaolalla. As expected, this one discusses the movie’s score and songs. It gives us another puffy show with only a handful of true insights. Next comes Digital Carpenters, an 11-minute, three-second piece with Gutierrez, Equihua, Booker, visual effects supervisor Augusto Schillaci, production designer Simon Vladimir Varela, art director Paul J. Sullivan, directing animator Louis Jones, supervising animators Bill Haller and Wesley Mandell, lead animator Eric Drobile, head of story Ricardo Curtis, and character specialist Jackie Koehler. “Carpenters” covers visual design and animation. After two happy talk-oriented shows, this one offers a higher ratio of actual information, so it works pretty well. Next comes a Music Video for “No Matter Where You Are” by Us the Duo. It offers a fairly standard mix of lip synch and movie clips, though the live-action stuff features film themes/visuals. Those help make the video a little more dynamic than most. Under Music Machine, we get a form of chapter search. This allows us to jump to any of the flick’s 16 musical performances – or to view them in one big 24-minute, 50-second package. I can’t claim this does a lot for me, but it’s a harmless addition. A Gallery breaks into five subdomains: “Meet the Cast” (12 images), “Production Art” (31), “Color Keys’ (41), “Background Poster Paintings” (16), and “The Final Look” (26). All offer useful material, though “Art”, “Keys” and “Paintings” fare best of all. The 2D disc opens with ads for The Peanuts Movie, Night at the Museum, The Penguins of Madagascar and Russell Madness. We also get a trailer for Book. The 3D disc begins with 3D trailers for Peanuts Movie and Rio 2. A third disc presents a DVD copy of Book. It includes the commentary, “Chuy”, “Music Machine”, the gallery and the promos. After a slow start, The Book of Life turns into a likable little adventure. With creative visuals and fun circumstances, the film embraces fantasy and emotion to a successful degree. The Blu-ray boasts excellent visuals as well as very good audio and a moderate array of supplements. Book becomes a mostly engaging animated tale, and the 3D rendition turns into a great way to view it.